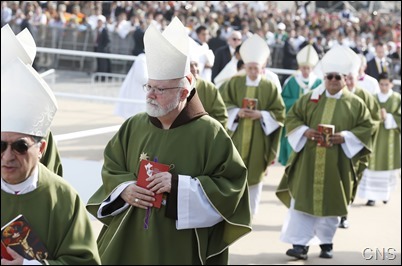 Following the March for Life last Friday, I departed for Lima, Peru to take part in the celebrations around the 60th anniversary of the Missionary Society of St. James the Apostle (commonly called the St. James Society). 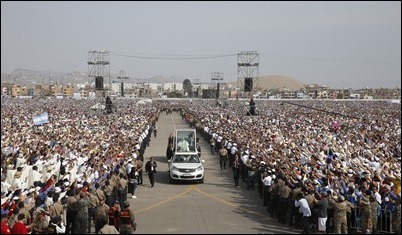 The anniversary celebrations, which were scheduled months ago, also coincided with the visit of the Holy Father to Peru. 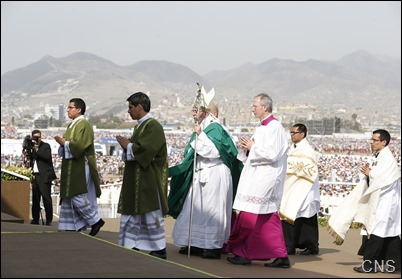 So, on Sunday I joined the Holy Father at his Mass in Lima. 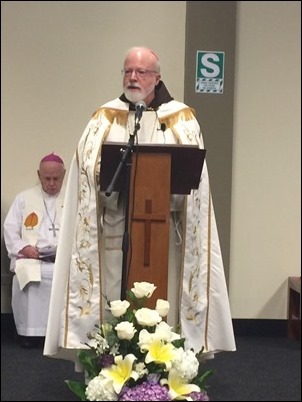 Also with us at the Mass was Bishop Robert Hennessey, who was in Peru for the St. James Society anniversary, as well. 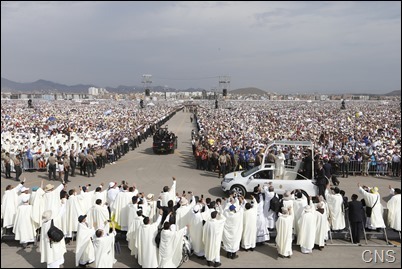 It was just an extraordinary celebration, and drew a crowd of over 1.5 million people. Behind the altar they had the most important religious symbol in the country, the statue of Nuestra Señora de los Milagros (Our Lady of the Miracles). At Most Holy Redeemer Parish in our archdiocese, we have that same statue because of the large Peruvian community in the parish. 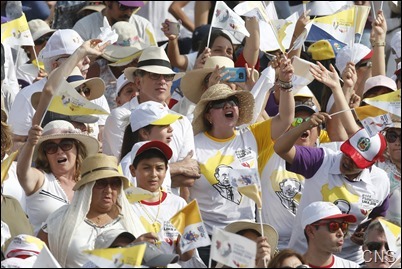 The Holy Father received just an extraordinary reception during this visit, and the people expressed a great enthusiasm for his message. 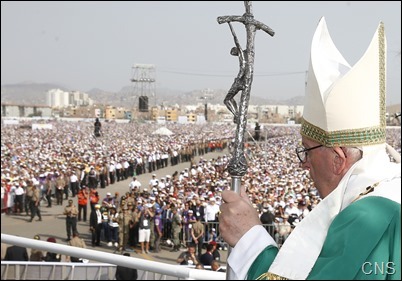 In fact, I think it was one of his more successful apostolic visits and I know the Holy Father was very pleased with how the visit went. 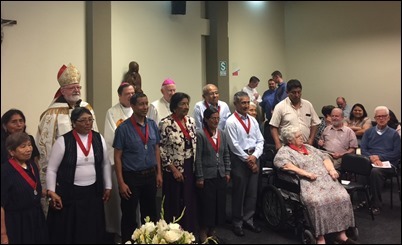 The Holy Father concluded his visit to Peru Sunday night and so, on Monday, we began the celebration of the St. James Society anniversary. We began with a Mass which brought together many “alumni” as they call them, former members of the society, who had returned to join with the current members and friends of the society in celebrating the anniversary. Of course, we were also joined by Father David Costello, who is the director of the St. James Society but lives in the North End. We were also very happy to be joined by Father Antonio Nardoianni, because in addition to being pastor of St. Leonard’s, he is also the pastor of St. Stephen’s Church, which serves as the headquarters of the St. James Society. Because of that, he was invited and we are so happy that he accepted the invitation and came down for the celebration. 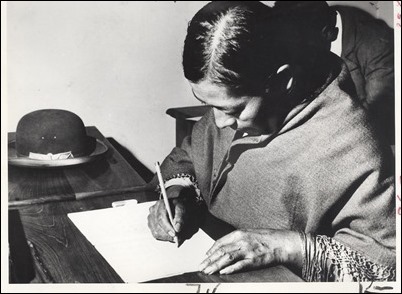 The society was founded in 1958 in response to Pope Pius XII’s call for bishops and superiors of North America to help the Church in Latin America which was growing, but experiencing a great shortage of clergy. 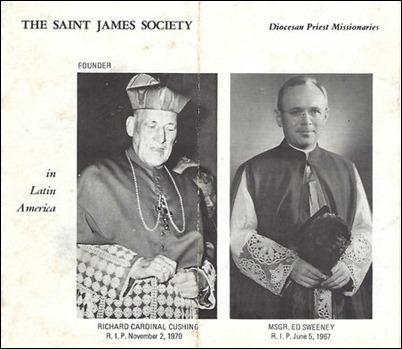 Cardinal Cushing embraced that call and established the St. James Society. 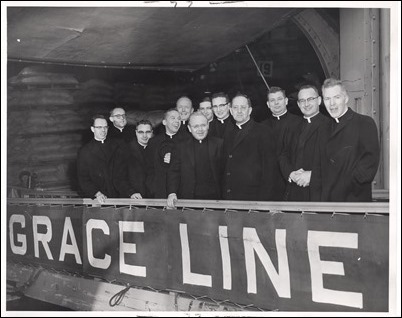 In 1959, the first group of priests, including Msgr. Edward Sweeney, who was the Director of the Propagation of the Faith and would serve as the superior of the society, left to establish a house in Lima. They were joined later that month by another group of priests from Boston. 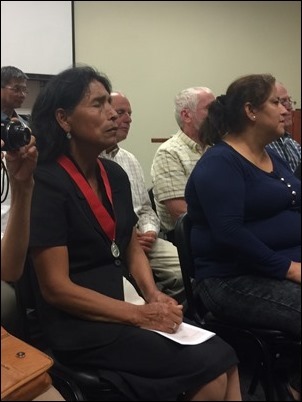 Eventually, they were joined by priests from other English-speaking countries, especially Ireland, and expanded their ministry to Bolivia and Ecuador. The way the society operated was somewhat unique at the time. 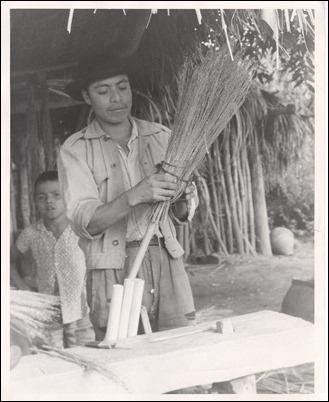 Rather than set up permanent missions, as some of the missionary orders had done, the priests of the society would travel to a remote village where the Church was struggling and begin new pastoral works or establish a parish school or start meal programs for the children — whatever the parish needed. 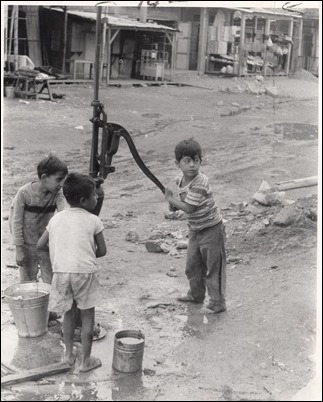 Then, once the programs were established and the parish was stable, the society would turn everything over to the local diocese and move on to a new area and begin helping them. 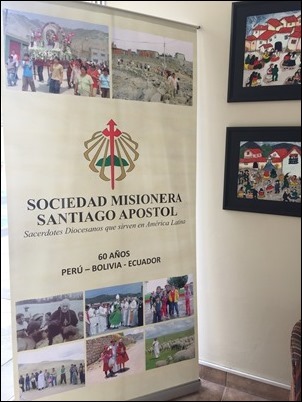 Over these 60 years, more than 330 priests have gone to serve with the society in Bolivia, Peru and Ecuador. I was very touched by the response of the Peruvian bishops who have priests from the St. James Society working in their dioceses. So many of them made a point of coming to the center house in Barranco in order to thank me and to thank all of the members of the St. James Society. It was very touching to hear the testimonies of those bishops. 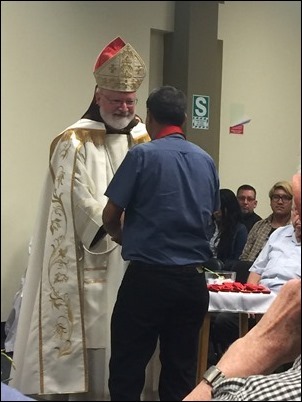 The society also had a wonderful side benefit in that many of these priests who spent time with the society, learning Spanish and coming to understand Hispanic culture, later came back to serve in Hispanic ministry, serving our own Spanish-speaking Catholics in the Archdiocese of Boston. 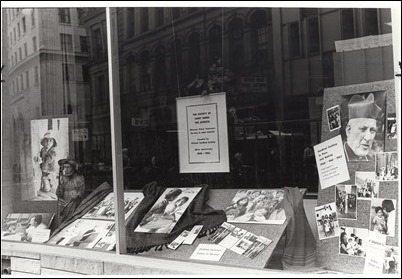 To celebrate the anniversary, they had a whole week of different events, including different guest speakers each day. On Tuesday we had the “centerpiece” of the week of celebrations — the presentation of the society’s Cheverus Awards at a Vespers service. Something like our own Cheverus Awards here in the archdiocese, laypeople and some religious sisters who have worked in the parishes or collaborated with works of the St. James Society were honored for their long-time work. It was a very beautiful celebration. 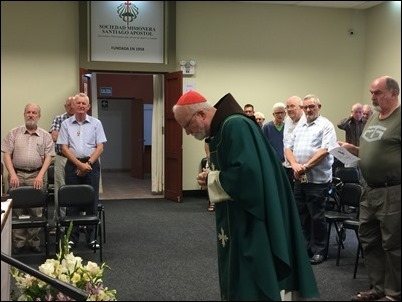 In all, the week was a wonderful time for priests who had worked with the society in the past to come together and celebrate the history of their ministries there.